Ambar Kelly Ltd has been in business as a limited company since 2003. 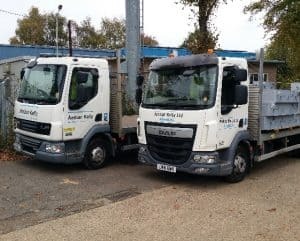 Based in Welwyn Garden City, the Company currently have two 7.5t Lorries and one 3.5t van. As an Engineering company, we employ 25 employees including one full-time driver. The company produces specialist and bespoke cast-in, patented RiserSafe® systems, which is a cradle to grave product that protects people from the danger of falling from height and stays in place throughout the life of a building. As a progressive company our ethos is one of a safety culture, both internally and within the building industry. We first heard about FORS through our client Mace in 2014. We looked at the benefits of joining the scheme and we saw that these were standards that complimented our own safety values. We achieved FORS Bronze accreditation in 2014, at this time the company had three employees and one vehicle. The audit process encouraged us to implement systems and best practices and enabled us to improve the transport side of our business. We soon went onto applying for our FORS Silver accreditation which we achieved in 2015. We currently have 25 employees, three vehicles and one full-time driver. ‘FORS works together with and compliments our own safety culture’ – Nick Atkinson, Director. FORS has benefitted us by being able to achieve higher standards through their driver training programme, both classroom based and through online modules, along with FORS toolbox talks. 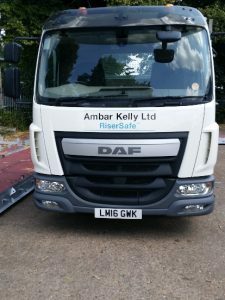 This has led to our driver and management having an enhanced understanding of road safety, fuel efficiency and tyre wear plus it has raised our awareness of the needs of other vulnerable road users. Our driver has completed the DCPC Safe Urban Driver course and both he and the management team have completed the FORS eLearning modules. ‘The company are committed to protecting the environment through sustainable use of materials and reducing CO2’ – Alex Bardett, Managing Director. Through the progression to Silver, we learnt that by equipping our vehicles and driver to the highest safety standards, our accident rate has remained at zero over the past four years. This has saved both time and money in reduced claims by the company. Our lorries are now fitted with recording 360 degree cameras, telematics, tracker systems, near side proximity sensors, audible left turn alarms, class IV,V, VI mirrors, lane departure warning and warning signage. Having a happy and healthy workforce is critical to the development of our company. We offer all employees private healthcare, annual medical screening and carry out bi-annual driver eye sight & health checks. We have a low turnover of staff but have now introduced a recruitment policy to ensure we encourage diversity in the workplace. At present we only have one full-time driver, but should we need to recruit in the future, we are committed to employing young drivers/employees where possible and training them into that role. Our comprehensive Driver Handbook covers our company policy on keeping noise pollution to a minimum. We have an anti-idling policy and have also carried out detailed noise risk assessments both in our factory and out on the sites that we deliver to. We are in the process of investigating what alternative vehicles we should invest in as and when our fleet need replacing. We are looking at those that reduce noise and emissions whilst being suitable for what we do. The market is not there yet but is heading in the right direction. The future plans of the company are to ensure that our safety record continues to be at the highest level, through driver training and fitment of vehicle safety equipment. Our company philosophy is to strive towards the safety of both our employees and the public, both in the workplace and of on the road. Achieving Gold accreditation will help us to continue to strive towards the highest road safety standards, it will complement the company’s safety principles and will allow us to continue to service our clients’ contracts, whilst protecting the environment.